Yes I do! When it was suggested that I did, at first, I was upset. I mean, after all a “Rose Coloured Glasses” point of view is bad… right? I needed to know, so did a little research. My indignant attitude was quickly transformed to one of pride. Yes, I dwell on everything positive about Roatan: I choose to not write stories, talk on the Roatan Vortex radio show, or post pictures that regard negative aspects of Roatan. There is a bonus to my “Rose Coloured Glasses” outlook. A study by the University of Toronto posted results of their findings in the Science Daily that showed that people who wear “Rose Coloured Glasses” see more! Whew, had me worried for a moment there! But since I avoid “operating heaving machinery”—mostly because I’m left handed and none of the controls are set up correct for me to use, and as for “airport luggage screener”–I’m way too happy to do that! I don’t need to worry about changing my Rosie… (OMG, that’s what I named my daughter) outlook! The negative: Tarantula landing on my head! That’s right, I was sitting on my bed (in the loft), laptop on my lap, watching TV too—multi-tasking, when I felt something land with a plop, on my head, it scurried down my back, then disappeared behind a pillow! Yes, I did the heebee-jeebee dance! 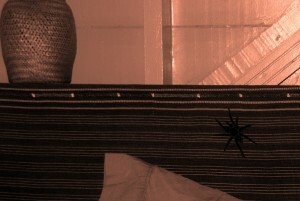 Yes, I took pictures of it when it exited from behind the pillow and hung out on the headboard for a while. Yes, I captured it with an empty ice-cream container and sent it on its way—outside! The Positive: The footprint of my cabana ceiling is approximately 20 ft x 16 ft, the footprint of the top of my head is approximately 4 in x 6 in. Isn’t that like the odds for winning a lottery! Of all the places that tarantula could have dropped—it landed smack in the middle of the top of my head! I got to experience something unique, aaand; I wasn’t sleeping when it dropped in… To feel it crawling across my face, or have it snuggle up next to me under the sheets. If that had happened it might have been a little tougher to find something positive in the whole event! 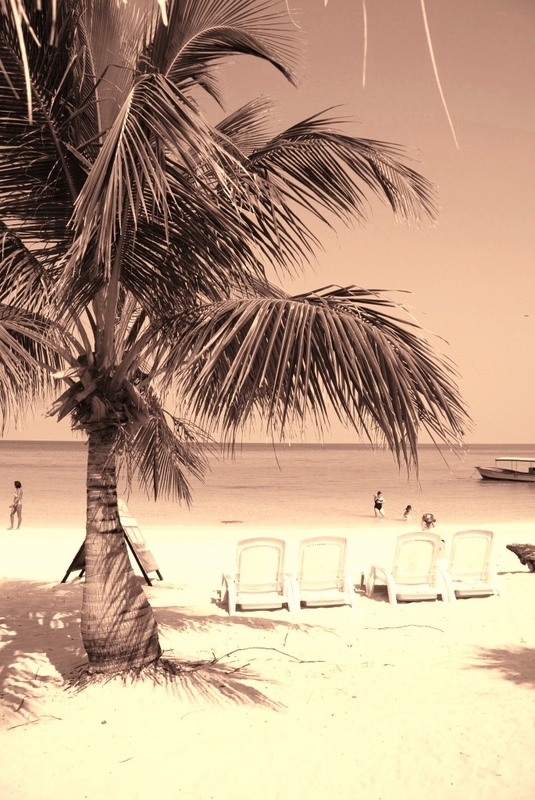 I love seeing Roatan through your rose colored glasses. The world needs more people who see the positive in life, and you are a wonderful ambassador for your adopted home. If I ever make it Roatan, you can bet you’ll be the first person I look up! Keep bringing that island vibe! Hey Chip, how the heck are you? Haven’t seen you around the web much lately. WHEN you come to Roatan, you better look me up… or I’ll hunt you down and beat you with my Rose Coloured Glasses!